New on DVD from Disney Junior comes Mickey Mouse Clubhouse: Minnie’s Pet Salon. The computer-animated series, which features all of the classic Mickey Mouse universe characters, began airing back in 2006. This material is aimed squarely at the toddler set, with simple stories, lots of sing-along tunes, and unsophisticated animation. Minnie’s Pet Salon is the main attraction here, billed somewhat misleadingly as a “full-length adventure.” What does full-length mean exactly? In this context, it means 30 minutes instead of the standard 24-minute running time for Mickey Mouse Clubhouse episodes. There are four of those shorter episodes collected here, but beware if you’ve been purchasing previous titles in the series: three of them have already turned up on older DVDs. Releasing in tandem with Minnie’s Pet Salon - and, for the record, sold separately - is the Popstar Minnie Pet Carrier. The connection? The wheel-based pet carrier contains a plush mini-dog toy and various “grooming” accessories. There’s a miniature hair brush, a plastic collar, a little water bowl, a perfume spray bottle, and a pink boa to drape around the dog. These accessories are of varying usability. For instance, the plastic collar, once unsnapped, does not re-fasten easily. The carrier itself is the most practical item. It’s a good-sized case that can be used to tote additional items. Given the Popstar Minnie Pet Carrier’s retail price, it probably should’ve included the DVD and been marketed together as a “deluxe” edition of the release instead of a rather costly separate item. 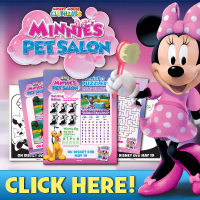 As for the DVD itself, Minnie’s Pet Salon includes a special comb that, unlike the toy doodads in the pet carrier, functions as an actual comb for human hair. The “full-length” title episode finds Minnie and Mickey Mouse, along with Pluto and Goofy, staging a pet show that includes a variety of animals. In addition to a few songs, we see the characters getting the various pets ready for the big show. Mild visual humor ensues, such as Goofy getting tripped up while trying to walk some pets. It’s not going to do much for parents, but the youngest of youngsters should find it entertaining. The other episodes include: “Donald’s Ducks” (previously available on the 2009 DVD release Mickey’s Big Splash), “Pluto Lends a Paw” (previously on the 2010 Road Rally DVD), “Daisy’s Pet Project” (previously on the 2012 I Heart Minnie DVD), and “Pluto’s Puppy-Sitting Adventure.” Only that last one, a season one episode from 2006, hasn’t been on DVD before. Those who haven’t been collecting the other DVDs will have just over two hours of content to enjoy. But those who have the previous titles will have only about 54 minutes of content new to their collection.